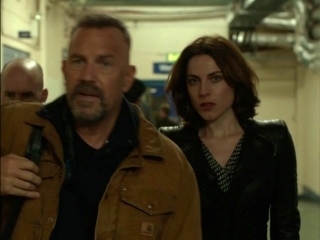 Director Ariel Vromen’s Criminal strands a standout Kevin Costner performance in a convoluted mess of half-baked ideas. Costner plays Jericho Stewart, a convicted criminal who (as a result of childhood abuse) has a damaged brain incapable of even the most basic of emotions. Turns out his brain has just the right type of frontal lobe (or something) to be the ideal test subject in a controversial new memory-transfer procedure. It’s fantastical of course, presented as top-secret pseudo-science. But it gives Costner something to work with in a film that isn’t entirely devoid of entertainment value (but should’ve provided a lot more). The impetus for the memory transfer is the murder of government agent Bill Pope (Ryan Reynolds, in what amounts to a cameo). The U.S. nuclear launch codes have been stolen by the so-called “Dutchman” (Michael Pitt), who plans to sell them to crazed terrorist couple Xavier (Jordi Mollà) and Elsa (Antje Traue). Pope knows where the Dutchman is, the money involved in the information exchange, and how to retrieve the codes before it’s too late. When he dies (no spoiler, it happens in the film’s opening sequence), Dr. Franks (Tommy Lee Jones, looking uncertain of how he stumbled into this movie) is charged with transferring Pope’s memories into Jericho’s brain. The film is at its most entertaining after Jericho breaks out on his own following the brain surgery. He resists his newly implanted memories at first, understandably unwilling (or unable) to accept that another man’s life now feels like his own. 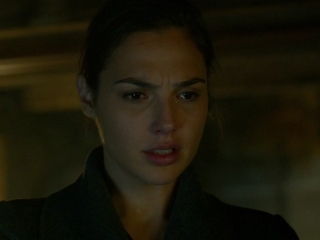 He tracks down Pope’s wife Jill (Gal Gadot) and is quickly confused by his (or rather Pope’s) emotional feelings for her. The weird, uneasy relationship that develops between Jericho and Jill is hard to swallow. Does Jill consider Jericho a “new” Bill? Can the former sociopath (who is, in fact, rapidly losing the beneficial effects of the memory transfer) really be a father to Jill and Bill’s young daughter? I’m getting a headache just trying to explain the convoluted, generic, Mission Impossible-style plot. What is moderately interesting about Criminal is that it’s sort of a summit for DC Comics film adaptation alumni. 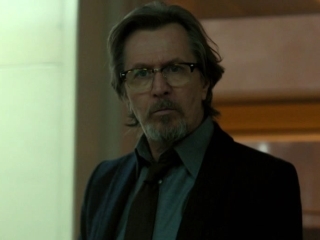 Coster was Pa Kent in Man of Steel, Ryan Reynolds was Hal Jordan in Green Lantern, Gal Gadot is Wonder Woman in Batman v Superman, Tommy Lee Jones was Harvey Dent in Batman Forever, Gary Oldman (stranded in a purely reactionary role as a CIA supervisor) played Commissioner Gordon in Christopher Nolan’s Dark Knight trilogy. Alice Eve (in an insignificant role here) was Carol Marcus in Star Trek Into Darkness. Okay, that connection is a bit of a stretch (Star Trek was a DC Comics property from the mid-’80s to the mid-’90s). Of course that’s all utterly meaningless but as Criminal‘s relatively taught first half gives way to an increasingly ludicrous second half, these are the thoughts that wander into one’s mind. 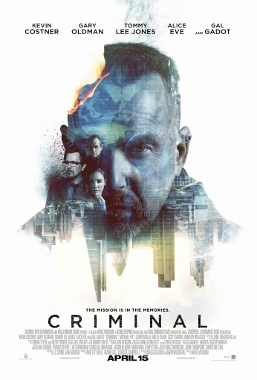 Director Ariel Vromen was previously best known for Iceman (2013), based on the true story of mob hitman Richard Kuklinski. Much as Criminal serves as an under-cooked showcase for a great Kevin Costner performance, Iceman was a mediocre film anchored by a great turn by Michael Shannon. Maybe for his next film Vromen can pair a great star turn with an equally great story. And hopefully a plausible one.